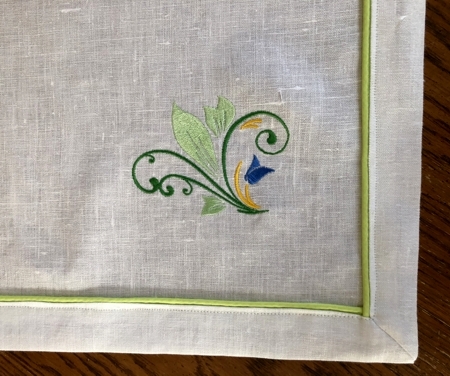 For this elegant spring-themed table topper we used the designs from the Spring Swirl Set for the Small hoop (4" x 4"). 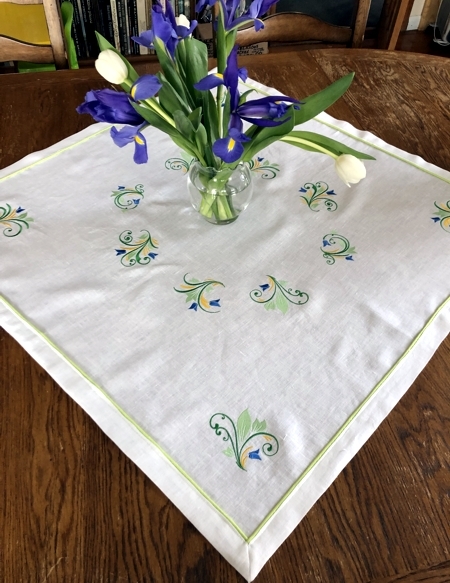 The finished size of the table topper is 34" x 34". 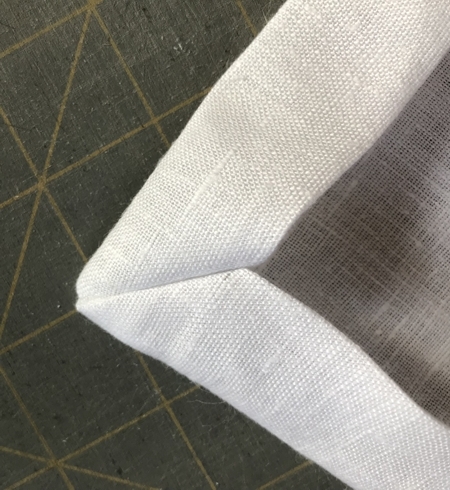 Fold the white fabric square in half vertically, align all edges and lightly press the folded line. Now fold the square horizontally, lightly press the folded line. 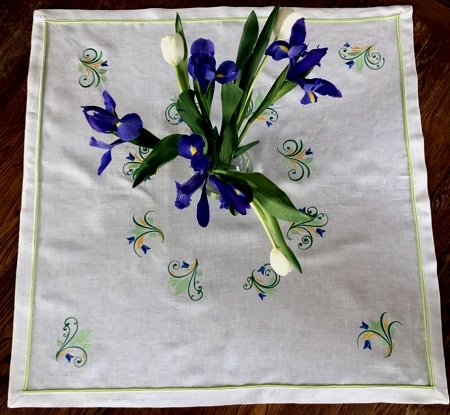 Fold the fabric diagonally, lightly press the folded line. Fold on another diagonal, lightly press. Your square now is divided into 8 sectors. Mark the position of the designs on each folded line, 5"-6" from the center. 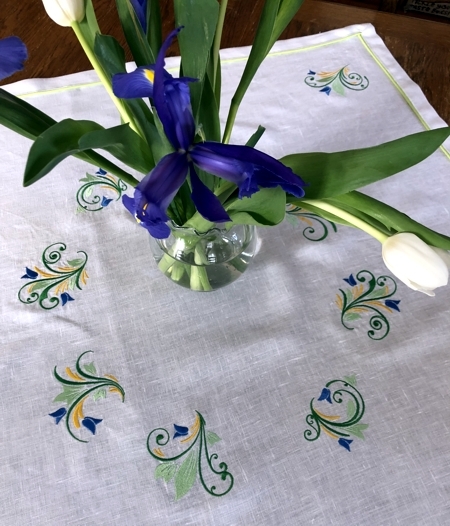 Upload the files from the Spring Swirl Set and embroider them one by one. 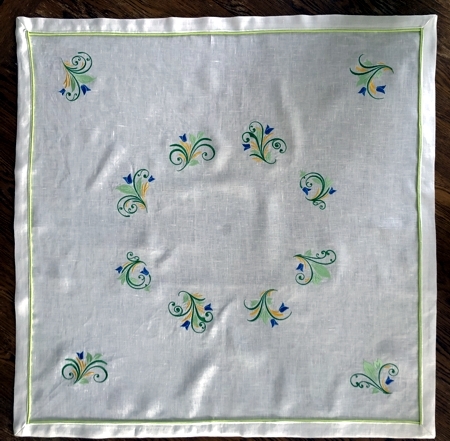 Then embroider 4 more designs on each diagonal, 6" from the corner. Cut away the excess stabilizer around the embroidery and place the piece into a basin with luke-warm water for about an hour. Change the water several times. Do not wring out! Place the working piece on a rack, spread out as much as possible to prevent wrinkles. Leave to air dry. When the working piece is lightly damp, take it from the rack and press with starch spray. Position the working piece on your pressing table, right side up/facing. 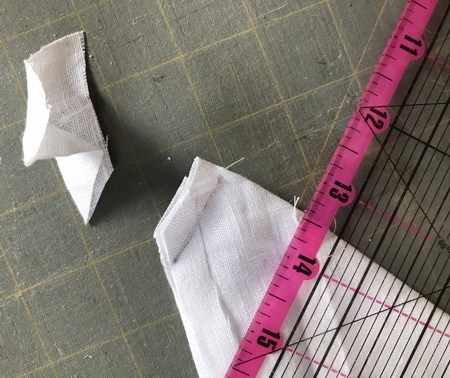 Working with one side of the square at a time, fold a side/edge 1/2"- 3/4" onto the right side of the topper and press lightly. Check that the width of the folded margin is even, then press heavily. Fold the fabric again, now 1" onto the right side of the topper, press lightly. Check that the width of the folded margin is even, then press heavily. 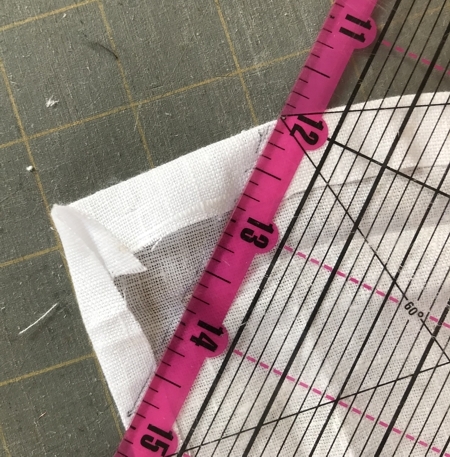 Working with one corner at a time, unfold the upper fold (the first crease remains in place), measure 2" from the corner in each direction and place marks. With a pencil and ruler, draw a line connecting the marks.. 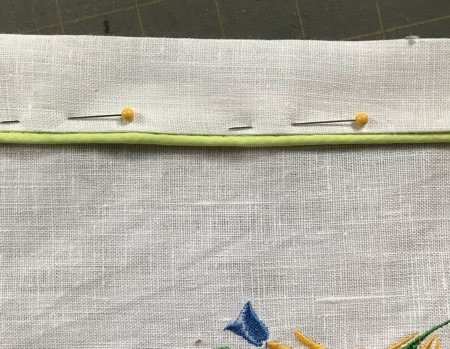 Fold the corner in half diagonally, with the drawn line facing up, align the marks, pin. Topstitch along the drawn line. Remember that we are working with the right side of the table topper facing up! Cut away the tip of the corner leaving 1/4" seam allowance. 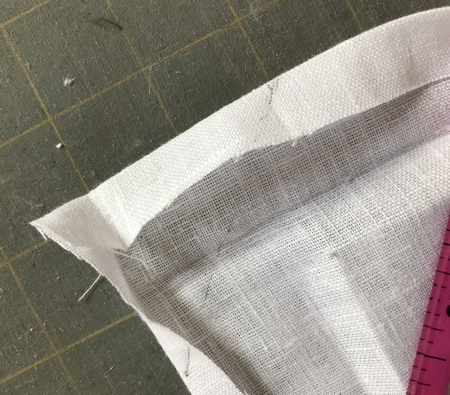 Turn the corner right side out, open the seam and press flat. Repeat for other corners. Insert the piping berween the folded edges and pin. Top-stitch the piping in place. Press the table topper again and you're done!